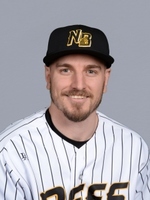 Bijan Rademacher joins the Bees for his first season in the Atlantic League and eighth of professional baseball. Last year he spent time with Triple-A Iowa of the Chicago Cubs organization, appearing in 114 games and posting a .251 batting average with 16 extra base hits, 31 RBI, and 26 runs scored. The 27-year-old was originally drafted by the Cubs in the 13th round of the 2012 MLB amateur draft. He spent his entire professional career with Chicago, reaching as high at the Triple-A level from 2016-18. Rademacher posted a career year in 2016, splitting time between Double-A Tennessee and Triple-A Iowa, recording a combined .307 batting average with 22 doubles, 10 home runs, 44 RBI, 53 runs scored, and a .385 on-base percentage. In 702 career minor league games, Bijan owns a .280 batting average with 122 doubles, 39 home runs, 282 RBI, and 305 runs scored.